Sonic the Comic 9 is the ninth issue of the Sonic the Comic series by Fleetway Editions Ltd. 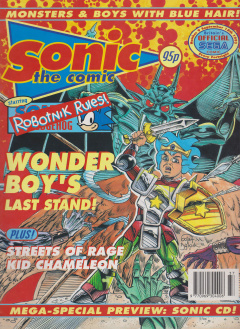 The comic contained four strips; a main Sonic story followed by three shorter strips based on other SEGA franchises: Kid Chameleon, Streets of Rage, and Wonder Boy. Speedlines: (Reader letters and artwork, with replies from Megadroid, the comic's mascot character. 1 Sonic the Hedgehog - "Back to Reality"
2 Kid Chameleon - "Kid Chameleon, Part 3"
3 Streets of Rage - "Streets of Rage, Part 3"
4 Wonder Boy - "Wonder Boy in Demon World, part 8"
Sonic the Hedgehog - "Back to Reality"
Following the events of last issue, the Omni-Viewer deposits Sonic, Tails, Porker, and Johnny back into the Emerald Hill Zone. Omni says Doctor Robotnik ordered him to "get rid" of Sonic by sending him into the future - an order he was forced to carry out - but that Robotnik's orders were not very specific. Omni quickly leaves, to allay suspicion back in the Special Zone. The four friends are attacked by tough new badniks resembling tanks - so strong that Sonic can't penetrate them with his Super Spin. Fortunately, he is able to make them angry then run between them, so that in their rage they shoot blindly and hit each other. The two tanks badniks are destroyed, releasing the Emerald Hill Folk trapped inside. The animals reveal that Sonic has been gone for 6 months, and was presumed dead. Johnny Lightfoot realises that Omni brought them only 6 months in the future, technically obeying Robotnik's orders but sending Sonic back to Mobius soon enough that he could still fix everything. They all rush to the village, where Sonic finds Robotnik is firmly in control: Robotnik's face is plastered on every wall, and the village is patrolled by Trooper badniks and Egg Cameras. One Trooper attempts to execute a bear for not reporting to work in the Chemical Plant (the penalty for everything being death under Robotnik's regime). Sonic manages to stop this, but is unable to defeat the Troopers - he can't use his full strength for fear of risking the Emerald Hill Folk trapped inside. Fortunately, it is revealed that Troopers do not have an animal trapped inside, and Sonic is able to let loose, destroying them all! Sonic turns to one of the floating Egg Cameras and tells Robotnik that he plans to rid Mobius of Robotnik once and for all. Robotnik, however, watching on a monitor, believes it is too late: he already rules the entire planet! Sonic and his friends are deposited six months in the future, having been sent there by Doctor Robotnik in the previous issue. The Emerald Hill Folk appear for the first time, although they have been mentioned previously. Trooper badniks appear for the first time (although they are referred to as "Soldiers"). They will become regular enemies of Sonic and the Freedom Fighters in future issues. It is established that Troopers do not possess organic batteries. The Chemical Plant work detail is mentioned by a Trooper badnik. Sonic infiltrates this detail to free the captives in the following issue. It is revealed that Robotnik has conquered the whole of planet Mobius. He will remain in power until Sonic the Comic #100, "The Final Victory". In the panel featuring the Robotnik-controlled village, a pair of rabbits can be seen defacing one of Robotnik's posters with the words "Robotnik Out!" This story was named after an episode of the TV sci-fi series Red Dwarf. At the time, writer Nigel Kitching's main job was writing and drawing strips for the Red Dwarf Smegazine, a spin-off magazine also published by Fleetway. (Ref: Comment #12606 at sonicthecomic Yahoo! Group, posted by Nigel Kitching). Kid Chameleon - "Kid Chameleon, Part 3"
Casey, now turned into the samurai Red Stealth, attacks the fire-breathing monster that has got Suzi. His attacks make the monster shrink and release Suzi. He gives Suzi his sword and tells her to run, then attacks the monster bare-handed. Unfortunately, he is caught and nearly defeated, before Suzi returns and slays the monster by stabbing it in the back with Red Stealth's sword. Casey attempts to remove his helmet to show Suzi who he is, but as he does so he says the word "Chameleon" and transforms again: this time into Eyeclops, Lord of Light. As Eyeclops, he is able to see several invisible imps that have surrounded them. He manages to fight them off, but when he turns to see if Suzi is okay, she has disappeared! Streets of Rage - "Streets of Rage, Part 3"
Ninja warriors attack Max Hatchet at a gym. He takes down three before he is hit with a tranquilizer dart and captured. At a comatose Axel Stone's bedside in hospital, Blaze Fielding discusses Max's kidnap with Police Officer Murphy. Murphy's honest, but afraid to quit the corrupt force because of his wife and son. Nevertheless, he promises that if Blaze calls him then he'll come with guns blazing. Wonder Boy - "Wonder Boy in Demon World, part 8"
Shion the Wonder Boy is surrounded by demons, looking for their slain master Grimomen. With the help of freed human captives from Grimomen's Pitcastle, Shion defeats the demons and marches towards the portal. He and the captives force the demons on guard to send them back to their village in Monster World. Once home, Shion finds that the village (burned down by the demons) is now being rebuilt by workmen sent by the Queen. The girl Baila wants Shion to stay with her awhile, but he has heard tales of ghosts in the Skyrock Mountains and decides it is time to move on. This page was last edited on 16 April 2018, at 16:11.